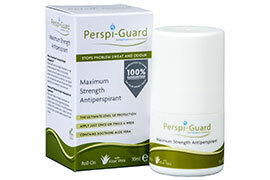 Perspi-Guard® is a range of high strength antiperspirant and deodorant products formulated to treat hyperhidrosis (excessive sweat production) and bromhidrosis (malodourous body odour). 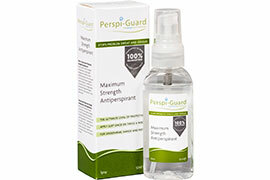 Products in the range include Perspi-Guard Maximum Strength Antiperspirant, Perspi-Guard Odour Control Bodywash and Perspi-Guard Sweat Defence. 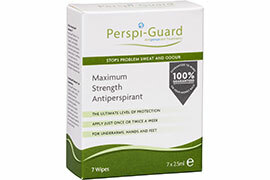 Perspi-Guard® products are available to order from Perspi-Guard Official Website, as well as Amazon.co.uk and other leading retailers. An exceptionally effective antiperspirant roll-on that only requires application once or twice per week. Exceptionally effective antiperspirant wipes that only require application once or twice per week.